Alcohol abuse and alcoholism don’t necessarily go hand in hand. Because of this, signs of alcoholics can sometimes be easy to miss. Serenity Addiction Centres are world leaders when it comes to the treatment of alcohol addiction and dependence. This is why we share these alcohol addiction facts to make sure you are as informed as possible and to help you decide whether or not you need to come to us for help. Once we have successfully helped a client detox, we work on a specialised recovery plan that is tailored to each specific patient and their needs. Alcohol dependence, also known as alcohol addiction or alcoholism, is a severe drinking habit that often results in strong urges to drink that can be at times impossible to control. People with alcohol addiction often find that alcohol takes up an important part of their day-to-day life, which can have the unfortunate effect of building up their tolerance, meaning over time they begin to drink even more. If you drink several times a week, or often feel like you need to go to the pub after work just to be able to relax, chances are you’re either dependent on alcohol or on your way to it. While it might not start off this way, alcohol addicts often drink because they crave the way alcohol makes them feel. If a non-alcoholic has a drink, they can enjoy it and then move on with their lives without it having a major effect. They’ll be able to take it or leave it, which may seem easy to somebody who has never suffered with alcoholism, but an alcoholic finds it difficult or even impossible to resist their urges. 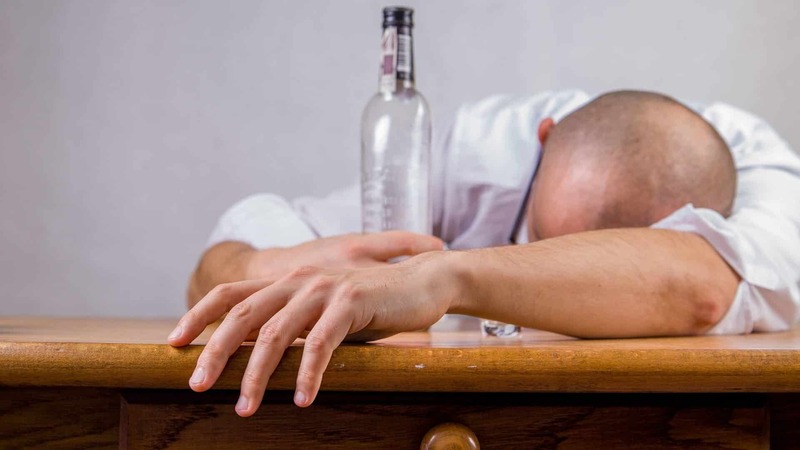 The craving and desire to drink can be completely overwhelming and can result in them drinking until they pass out. An alcohol addict simply can’t make rational and reasonable decisions about alcohol or just choose to stop and follow through with it. Why Do Alcoholics Start Drinking? There can be many causes – stress, family problems, bereavement, money worries, illness. Someone might pick up a drink to destress, and then find that they are doing it more and more just to get through the day instead of naturally being able to cope with whatever issues may be going on in their lives. On the other hand, there are cases where someone takes just one drink, and that’s enough to become addicted. Alcohol misuse doesn’t necessarily even need to be involved, as some people just naturally have an addictive personality. Usually, the addictive behaviour is driven by multiple factors. In lots of cases, it has been shown to run in families. This is believed to be attributable to both the genetic makeup of the individual as well as the attitudes to alcohol that they’ve grown up with. It has further been proven that alcohol dependency is more prevalent amongst those with some form of psychiatric disorder. Whether it’s anxiety, depression, post-traumatic stress disorder, or similar related issues. There can be a tendency to self-medicate – one which you might recognise in yourself. Although some feel that this provides short-term relief, the long-term effect of combining alcoholic and mental illness is an even greater imbalance of the chemical ratios in your brain, and professional help and often rehab is the only long term way of recovering from both. Alcoholism is a serious and debilitating mental illness that almost always requires treatment to overcome. If you think you may be an alcoholic, we highly recommend calling us now for free advice on your next steps and how we can help you get control of your life and get back on track. Alcohol addiction symptoms can be pretty hard to spot. Unlike illegal drugs, alcohol is a common and accepted part of our society and culture. Plenty of people in the UK drink regularly and some may even appear to be an alcoholic at one time in their life, for example when first going to university, but then get over it very quickly. Even for professionals, it can be sometimes be difficult to immediately tell the difference between an alcoholic and somebody who just likes to drink regularly but has control of the habit. Of course, if you get withdrawal signs after not drinking for 6-12 hours, that is also a big sign. Withdrawal symptoms can include nausea, shaking, sweating and insomnia. Have you ever decided to stop drinking for a period of time or for good, but only lasted a couple of days? Do you get defensive when people ask about your drinking or ask them to mind their own business? Do you ever drink upon waking up? Do you blackout from drinking? Do you feel that your life would be better if you didn’t drink? Have you ever gone to get extra drinks while at a party, feeling that what was being served wasn’t enough? If you answered yes to three or more of the questions above, you could be in trouble with your drinking. If you’re still not sure about the signs you’re an alcoholic, we recommend contacting us for advice. Spotting alcohol dependency and treating it early on can make it possible to avoid the majority of health complications. If you know somebody you think may be an alcoholic, try to avoid shaming them or making them feel guilty, as this can make them withdraw into their shell and become more defensive, and even make them avoid you. Approach them supportively, make it clear you are here for them and want to help them get the best from their lives. If this doesn’t work, it is, unfortunately, time to get professional help. Alcohol has some serious side effects and some of the most recent alcohol addiction statistics suggest the substance is responsible for around 8,000 deaths per year in the UK alone. And this is without even getting into the dangers caused by drink driving. Even your financial well-being can be adversely impacted, with many alcoholics finding that they’re unable to perform at work and eventually end up losing their employment. This can not only further deepen the anxiety and depression you may be feeling, but also leave you with lots of extra hours in the day – hours that you might be tempted to spend drinking in order to boost your mood. Alcoholic dementia is a serious problem caused when the brain is damaged by long term regular drinking. Alcoholic hepatitis is when heavy alcohol consumption over a long period of time causes the liver to inflame. Continuing to drink with alcoholic hepatitis is incredible dangerous and can lead to internal bleeding or liver failure. We understand that taking the decision to commit to rehab can be extremely scary, and your mind can conjure up all sorts of images. The main focus of our rehabilitation facilities is to create a relaxed and stress free environment, surrounded by some of the world’s leading doctors, therapists and counsellors in order to give you the best possible chance of recovery. If you are interested, you can schedule a tour of one your local rehab centres to see the available facilities, resources and environment. This can help you with taking the first steps towards your rehabilitation, but is completely free of charge and comes with no obligations, so you have nothing to lose in giving us a call and seeing what we can offer. You can also use our handy map to find rehab centres near you. For more information on our rehabilitation programs, please see our Alcohol Rehab page to see what we can do for you. As we all know, the road to recovery begins with admitting you have an issue. It is unfortunately impossible to overcome alcoholism for somebody who doesn’t believe they have a problem. Detoxing before alcohol addiction treatment is one of the best things you can do as it lets you operate without any alcohol in your system, and it gives you confidence in your own ability to control your problems. For help with this please check out our expert guide on how to safely home detox from alcohol. If this is impossible, you can of course be admitted to one of our rehabilitation centres so that professionals can supervise you and aid in your detox. We highly recommend contacting us to see what we can offer in your local area if this is something you believe you need. Don’t forget we are always available on the phone to give free advice, so if you’re not sure, give us a call now! There’s nothing to lose, and everything to gain.